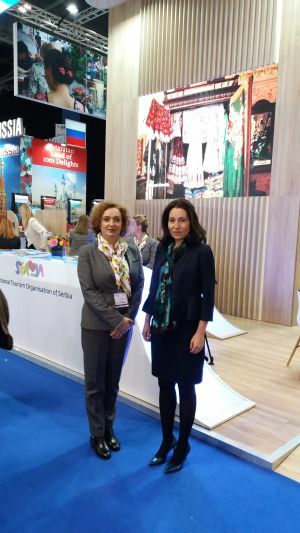 The National Tourism Organization of Serbia presented the tourist offer of our country at the tourism fair "World Travel Market" (WTM) 2017, which was held in London from 6 to 8 November 2017. 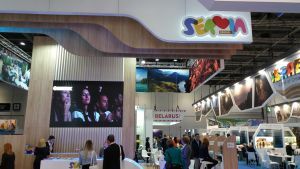 Representatives of the biggest tour operators, such as Regent Holidays from the UK, Travel the Unknown, Exodus and Thomas Cook, showed great interest in Serbia as a tourist destination. TOS Director Maria Labović gave interviews to Travel Channel, Travel Weekly Magazine, Food and Travel Magazine, Sailing Travel Magazine, BBC, National Geographic and others. Strengthening the recognition of Serbia as a tourist destination and building long-term business relationships will enable further prospects and growth in the tourism industry. On the first day of the fair, the exhibition stand of Serbia was visited by Nataša Marić, Charge d'Affaires a.i. in the Embassy of the Republic of Serbia in London.